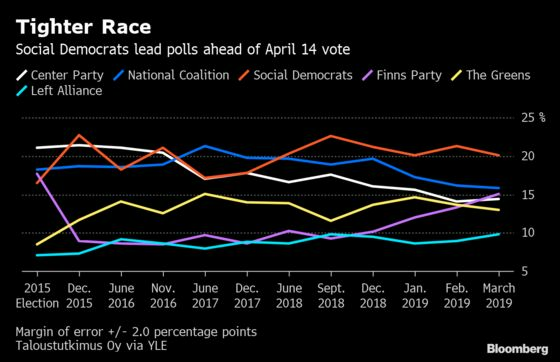 (Bloomberg) -- The man tipped to become Finland’s next prime minister is a gaffe-prone, quick-to-the-point former trade unionist called “the toughest labor market gangster” by those who have faced him at the negotiating table. Social Democratic leader Antti Rinne may now have to appeal to his inner diplomat if, as polls suggests, he’s to succeed in pushing through tax and public spending increases at the helm of a governing coalition that will likely have to include parties from both the left and the right. A win by the 56-year-old politician in the April 14 election would make him a rare sight in Europe, a continent where the old powerful Social Democratic parties have been on the retreat to populist forces. But Rinne, who served briefly as finance minister and deputy prime minister between 2014 and 2015, has built support over the past four years by challenging millionaire Prime Minister Juha Sipila’s austerity programs. Having used his close connections with the unions to rise to the helm of the party, he’s betting those ties will come to good use while in government. According to official estimates, Finland will need to create at least 100,000 new jobs over the next four years to counter the threat posed to the country’s generous welfare state by an aging population. Rinne has railed against Sipila’s “forced and dictated” policies and vowed to “restore the lost trust” through equitable politics. Fairness is a frequent word in his vocabulary, and he’s planning to reverse an unpopular policy of pushing the unemployed to prove they are actively seeking work. He also wants women and men to be paid the same and to divide parental leave more evenly. Rinne is in his third marriage, having met wife Heta through work. He has two children and two step-children with previous wife Merja. His public life has not been shy of controversy. His recipe for a pasta sauce that contains twice as much bacon and Swiss cheese than spaghetti has raised eyebrows among gourmets, and he’s had to defend his fitness after a recent series of health scares, including coronary heart disease. His supporters prefer to highlight his ability to absorb information and complete tasks quickly, as evinced by him completing a law degree in just one year and a half. Though voters appear to approve of him, his plans don’t resonate well with economists. “The Social Democrats’ planned tax hikes and looser fiscal policies are not justified in the current economic cycle,” said Pasi Kuoppamaki, chief economist at Danske Bank A/S in Helsinki, who pointed to slowing growth rates. Even so, the Social Democrats aren’t likely to be able to dictate the agenda. 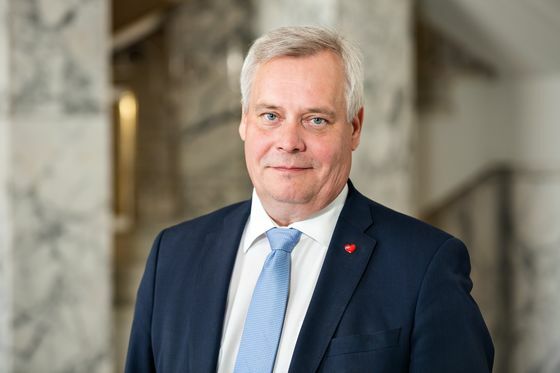 Polls suggest Rinne won’t be able to form a majority with his traditional left-wing allies alone and may have to reach out to the center-right National Coalition of Petteri Orpo, the outgoing finance minister. Those who know him say compromise isn’t beyond his reach. Antti is a quick decision-maker, he’s witty and can absorb information fast, said Anssi Vuorio, who worked for Rinne at Pro, a trade union that represents managerial staff. He’s also “a tough negotiator, but he’s able to find compromises too,” Vuorio said.